We protect your loved ones! Born and bred in Texas, Buckaroo Pest Protection is a family owned company devoted to protecting your loved ones from pests and pesticide exposure by using advanced techniques, botanical based materials, and barricades. Inspired by the spirit of the frontier and backed by the technology of the future. We’re proud to announce that Buckaroo Pest Protection is a Certified Sentricon Specialist™. Most insurance companies view termite damage as preventable, which means your homeowners policy won’t pay for damage caused by termites. With the Sentricon® system, termites are nearly 10 times more likely to eat the bait than wood. Watch the video to learn more about why Sentricon® is so effective. 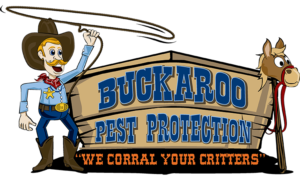 Buckaroo Pest Protection is your premier provider of effective, comprehensive, and non-intrusive pest control services in North Texas. Our posse will perform all all-encompassing property inspection to identify points of entry, type of infestation, and the best treatment options. We will then customize a maintenance plan using what we like to call A.N.T.S. which stands for: Automatic, Notification, Technology System. We protect your loved ones from pests & pesticide exposure by using botanical & barricades. We pride ourselves in efficiently creating a barrier between you and the insects, rodents, and pests. Our posse knows what works… and what doesn’t! We strategically make applications using tried and true embedding techniques where bugs hide, breed, and fester. We take care of your infestation lock, stock and barrel. Feathery, shiny, slippery, furry, winged, stinging. No matter what type of pest plagues your home or business, we have the knowledge and experience to get them out and keep them out.